This vintage Calatrava reference 96 is just insanely nice. First of all, the stainless case is really something special. Patek’s production of stainless steel Calatravas, throughout the Calatrava’s 60+ years of production, is extremely limited. Also, the dial on this watch is for all intents and purposes a “piece unique”. Patek may have made other reference 96s with this dial, but this is the only one any of us will see in this limetime. Not only is this watch rare, its condition is perhaps the only aspect of it that can compete with its rarity. The watch is entirely and completely original, including the dial, and is in mint condition. The case is not pristine- it has some very light marks- but more importantly it has its original finish an presents as never polished or altered in any way; the case edges are sharp and crisp as the is the original brush finish. The original dial and hands are mint. Simply this is a museum quality vintage Patek Phillipe and was purchased out of an elite collection of vintage Calatravas. Original stainless steel case measures 31mm by 9.5mm thick. The lugs are long and never polished. The bezel has its original brush finish. The crystal is domed. Original dial is silver with applied Arabic numerals with interstitial minutes chapter, gorgeous original leaf style hands and blued seconds hand in the subsidiary seconds dial. Original movement is the manual winding Caliber 12’’’ 120 and is operating well. Strap and buckle are vintage Patek Phillipe, although it is doubtful that the strap is original to the watch. 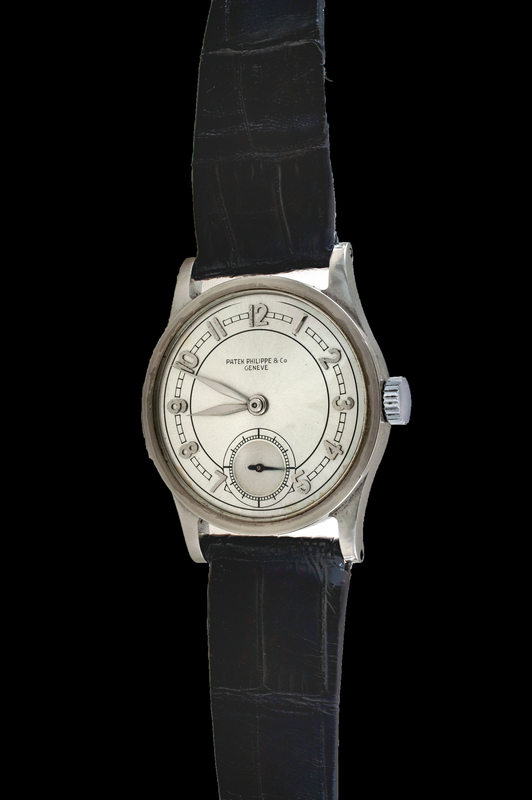 This wonderful vintage Patek will be delivered with its extract from the archives which shows its date of manufacture as 1937 and its date of original sale as April 15, 1937. Wonderful!